ABOVE: If you aren't traveling with a direction-sniffing service dog, read the advice in this article. It's often said that getting lost is half the fun when you're exploring Venice, but there are times when you simply want to find your destination--especially if you're jetlagged and need to reach your hotel, or when it's 2 p.m. and your train leaves at 2:30. In the following pages, we'll show how to rescue yourself when you're lost in Venice's rabbit warren of calli and campi. 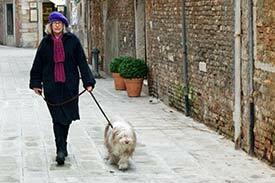 Note: This article is geared toward pedestrian travel in Venice. For advice on getting around the city by vaporetto, water taxi, and other modes of transport, see Arriving in Venice and our Venice local transportation index.